LG 390W Bifacial Solar Module. Model LG390N2T-A5. 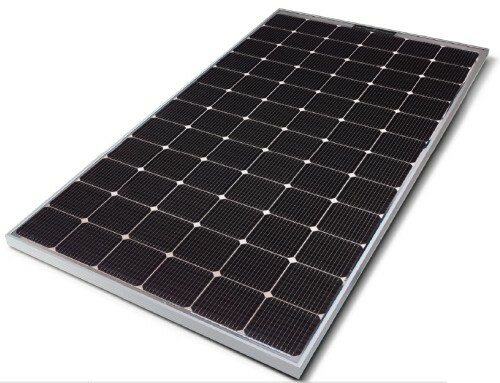 Absorbing daylight power through both the front & back of the solar module greatly enhances the output of this module. Ideal for applications that have open racking and bright surroundings (glass, snow, concrete, etc). LG's advanced bifacial solar module LG390N2T-A5. Ideal for maximizing power production on tilt-up racking, ground mount, commercial roof mount, and many marine applications. Absorbing daylight power through both the front & back of the solar module greatly enhances the output of this module. Ideal for applications that have open racking and bright surroundings (glass, snow, concrete, etc). This is a 72-Cell module. NeON® 2 BiFacial modules are designed to utilize both sides of the PV module for absorbing more light and generating more energy. Compared with standard 3 or 4 busbar bifacial PV module, LG modules use Cello technology using 12 thin wires to enhance performance and reliability. More energy yield can be provided with LG NeON® 2 BiFacial. LG NeON® 2 BiFacial modules use highly effcient bifacial solar cell, “NeON” applied Cello technology. Through the Cello technology, LG NeON® 2 BiFacial can achieve up to 30% more energy than standard PV module. LG NeON® 2 BiFacial now performs better on sunny days thanks to its improved temperature coeffciency. LG NeON® 2 BiFacial can reduce the total number of strings due to its high module efficiency resulting in a more cost effective and ef cient solar power system. The n-type cells used in LG NeON® 2 BiFacial have almost no boron, which may cause the initial ef ciency to drop, leading to less LID. LG NeON® 2 BiFacial has an enhanced performance warranty. LG NeON® 2 BiFacial is guaranteed at least 83.6% of initial performance.